Lucille Désirée Ball (August 6, 1911 – April 26, 1989) was an iconic American actress, comedian and star of the landmark sitcom I Love Lucy. She was also a four-time Emmy Award winner and charter member of the Television Hall of Fame. A B-grade movie star and "glamour girl" of the 1930s and 1940s, she later achieved tremendous success as a television actress. She received the Kennedy Center Honors in 1986. Lucille, known as the "Queen of Comedy," was also responsible with her husband, Desi Arnaz, for the founding of Desilu Studios, a pioneering studio in American television production in the 1950s and 1960s. Lucille Ball was born to Henry Durrell Ball and Desiree "DeDe" Eve Hunt in Jamestown, New York, and grew up in the adjacent small town of Celoron. Her family was Baptist; her father being of Scottish descent and related to George Washington. Her mother was of French, Irish, and English descent. Lucille was proud of her family and heritage. Her genealogy can be traced back to the earliest settlers in the colonies. One direct ancestor, William Sprague, left England on the ship Lyon's Whelp for Plymouth, Massachusetts. Along with his two brothers, William helped to found the city of Charlestown, Massachusetts. Other Sprague relatives became soldiers in the American Revolutionary War and two of them became governors of the state of Rhode Island. Her father was a telephone lineman for the Bell Company, while her mother was often described as a lively and energetic young woman. Her father's job required frequent transfers, and within three years after her birth, Lucille had moved many times, from Jamestown to Anaconda, Montana, and then to Wyandotte, Michigan. While DeDe Ball was expecting her second child, Frederick, Henry Ball contracted typhoid fever and died in February 1915. After her father died, Lucille and her brother Fred were raised by her working mother and grandparents. Her grandfather, Fred C. Hunt, was an eccentric socialist who enjoyed the theater. He frequently took the family to vaudeville shows and encouraged young Lucy to take part in school plays. In 1925, Lucille decided to enroll in the John Murray Anderson School for the Dramatic Arts in New York City with her mother's approval. There, the shy girl was outshone by another pupil, Bette Davis. She went home a few weeks later when drama coaches told her that she "had no future at all as a performer." She moved back to New York City in 1932 to become an actress and had some success as a fashion model for designer Hattie Carnegie and as the Chesterfield girl. She began her performing career on Broadway using the stage name "Diane Belmont" and was hired, but then quickly fired by theater manager Earl Carroll. She was fired again from the Shubert brothers’ production of Stepping Stones. After an uncredited stint as a Goldwyn Girl in Roman Scandals, she moved to Hollywood to appear in films. She appeared in many small movie roles in the 1930s as a contract player for RKO, where she met her lifelong friend, Ginger Rogers. Lucille was signed to MGM in the 1940s, but she never achieved great success in films. In 1940, Lucille met Cuban bandleader Desi Arnaz while filming the film version of the Rodgers and Hart stage hit Too Many Girls. Lucille and Desi connected immediately and eloped the same year. Though the couple loved each other, they had many tumultuous times together. Desi was drafted to the United States Army in 1942; he ended up being classified for limited service due to a knee injury. As a result, he stayed in Los Angeles, organizing and performing USO shows for wounded GIs being brought back from the Pacific. In 1948, Lucille was cast as Liz Cugat, a wacky wife, in My Favorite Husband, a radio program for CBS. 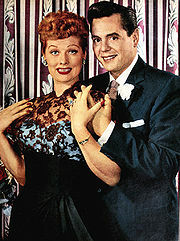 The program was successful, and CBS asked her to develop it for television, a show that eventually became I Love Lucy. She agreed, but insisted on working with Desi. CBS executives were reluctant, thinking the public would not accept an all-American redhead and a Cuban as a couple. CBS was initially not impressed with the pilot episode produced by the couple's Desilu Productions company, so the couple toured the road in a vaudeville act with Lucy as the zany housewife wanting to get in Arnaz's show. The tour was a smash, and CBS put the show on their lineup. In 1953, she was subpoenaed by the House Committee on Un-American Activities because she had registered to vote in the Communist Party primary election in 1936 at her socialist grandfather's insistence. In response to these accusations, Desi quipped: "The only thing red about Lucy is her hair, and even that's not legitimate." Lucille survived this encounter with the HUAC, naming no names. The I Love Lucy show was not only a star vehicle for Lucille Ball, but a way for her to try to salvage her marriage to Desi Arnaz, which had become badly strained, in part by the fact that each had a hectic performing schedule that often kept them apart. Desilu and I Love Lucy pioneered a number of methods still in use in television production today. When the show premiered, most shows were captured by kinescope, and the picture was inferior to film. The decision was made to film the series, a decision driven by the performers' desire to stay in Los Angeles. Sponsor Philip Morris did not want to show kinescopes to the major markets on the East Coast, so Desilu agreed to take a pay cut to finance filming. In return, CBS relinquished the show rights back to Desilu after broadcast, not realizing they were giving away a valuable and durable asset. Desilu made many millions of dollars on I Love Lucy rebroadcasts through syndication and became a textbook example of how a show can be profitable in second-run syndication. Desilu also hired legendary Czech cameraman Karl Freund as their director of photography. Freund used a three-camera setup, which became the standard way of filming situation comedies. Shooting long shots, medium shots, and close-ups on a comedy in front of a live audience demanded discipline, technique, and close choreography. Among other non-standard techniques used in filming the show, cans of paint (in shades ranging from white to medium gray) were kept on set to "paint out" inappropriate shadows and disguise lighting flaws. On July 17, 1951, just one month shy of her 40th birthday, Lucille gave birth to her first child, Lucie Desiree Arnaz. A year and a half later, her second child, Desiderio Alberto Arnaz IV, known as Desi Arnaz, Jr. arrived. When he was born, I Love Lucy was a solid ratings hit, and Ball and Arnaz wrote the pregnancy into the show (indeed, Ball gave birth in real life on the same day that her Lucy Ricardo character gave birth). There were several challenges from CBS, insisting that a pregnant woman could not be shown on television, nor could the word "pregnant" be spoken on-air. After approval from several religious figures, the network allowed the pregnancy storyline, but insisted that the word "expecting" be used instead of "pregnant." (Arnaz garnered laughs when he deliberately mispronounced it as "'spectin'.”) The birth made the first cover of TV Guide in January 1953. I Love Lucy dominated the weekly TV ratings in the United States for most of its run. The strenuous rehearsals and demands of Desilu studio kept the Arnazes too busy to comprehend the show's success. According to a number of sources, such as biographers Stern Kanfer and Bart Andrews, when the couple finally found time to attend a Hollywood movie premiere in late 1953, the entire star-studded audience stood and turned with a thunderous applause. It finally connected with the Arnazes. I Love Lucy had made them the biggest stars in the nation, even among the Hollywood elite. By the end of the 1950s, Desilu had become a large company, causing a good deal of stress for both Lucille and Desi. On May 4, 1960, the very day after filming the final episode of The Lucy-Desi Comedy Hour, the couple divorced, ending one of television's greatest marriages. However, until his death in 1986, Desi would remain friends with Lucille. Indeed, both Lucille and Desi spoke lovingly of each other after the breakup. The following year, Lucille married comedian Gary Morton, a Borscht Belt stand-up comic who was twelve years younger than her. Morton told interviewers at the time that he had never seen Lucille on television, since he was always performing during primetime. She immediately installed Morton in her production company, teaching him the television business and eventually promoting him to producer. Morton also played occasional bit parts on Lucille's various series. Following I Love Lucy, Lucille appeared in the Broadway musical Wildcat, which was a wildly successful sell-out that ended up losing money and closing early when Ball became too ill to continue in the show. She made a few more movies including Yours, Mine and Ours, and the musical Mame, and two more successful long-running sitcoms for CBS: The Lucy Show, which costarred Vivian Vance and Gale Gordon, and Here's Lucy, which also featured Gordon, as well Lucy's real life children, Lucie Arnaz and Desi Arnaz, Jr.
Lucille Ball at her last public appearance. Photo taken at the 61st Academy Awards by Alan Light. During the mid-1980s, she attempted to resurrect her television career. In 1982, Ball hosted a two-part Three's Company retrospective, showing clips from the show's first five seasons, summarizing memorable plotlines, and commenting on her love of the show. The second part of the special ended with her receiving a kiss on the cheek from John Ritter. A 1985 dramatic made-for-TV film about an elderly homeless woman, Stone Pillow, was well-received. However, her 1986 sitcom comeback Life with Lucy (costarring her longtime foil Gale Gordon) was a critical and commercial flop, which was canceled less than two months into its run by ABC and producer Aaron Spelling. The failure of this series was said to have sent Ball into a serious depression; she struggled with alcoholism, and other than a few miscellaneous awards show appearances, she was absent from the public eye for the last several years of her life. 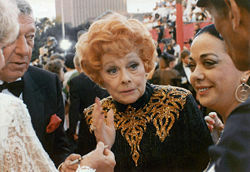 Her last appearance, several weeks before her death, was at the Oscar telecast in which she was presented by Bob Hope to a cheering audience. 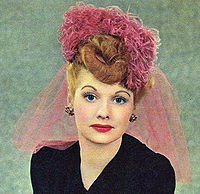 Lucille Ball died on April 26, 1989, of a ruptured aorta at the age of 77 and was cremated. Her remains were initially interred in the Forest Lawn–Hollywood Hills Cemetery in Los Angeles. Her ashes were relocated to Jamestown, New York by next-of-kin in 2002. 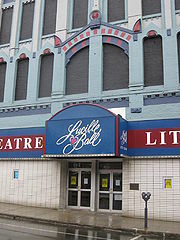 There is a Lucille Ball-Desi Arnaz Center museum in Lucy's hometown of Jamestown, New York. Ball received many prestigious awards throughout her career including some posthumously, such as the Presidential Medal of Freedom by President George H. W. Bush on July 6, 1989, and The Women's International Center's 'Living Legacy Award'. On February 8, 1960, Ball was awarded two stars on the Hollywood Walk of Fame: one at 6436 Hollywood Boulevard for contributions to motion pictures, and one at 6100 Hollywood Boulevard for television. Ball was among Time magazine's "100 Most Important People of the Century." On August 6, 2001, which would have been her 90th birthday, the United States Postal Service honored her with a commemorative postage stamp as part of its Legends of Hollywood series. Because of her liberated mindset and approval of the Women's Movement, Ball was inducted into the National Women's Hall of Fame in 2001. On August 6, 2011, which would have been her 100th birthday, Google honored Ball with an interactive doodle on their homepage. This doodle displayed six classic moments from I Love Lucy. This page was last modified on 2 August 2018, at 15:50.